Happy Thursday! If you are on track with the sew along, today is your final day. If not, no worries because tomorrow is a catch up day! Are you loving your elastic waistband? Yesterday I made 6 Animazings, and they are so quick when I use elastic instead of buttons! Today your only task is to sew up the skirt. If you are not adding a ruffle hem, go ahead and follow the pattern to the end. 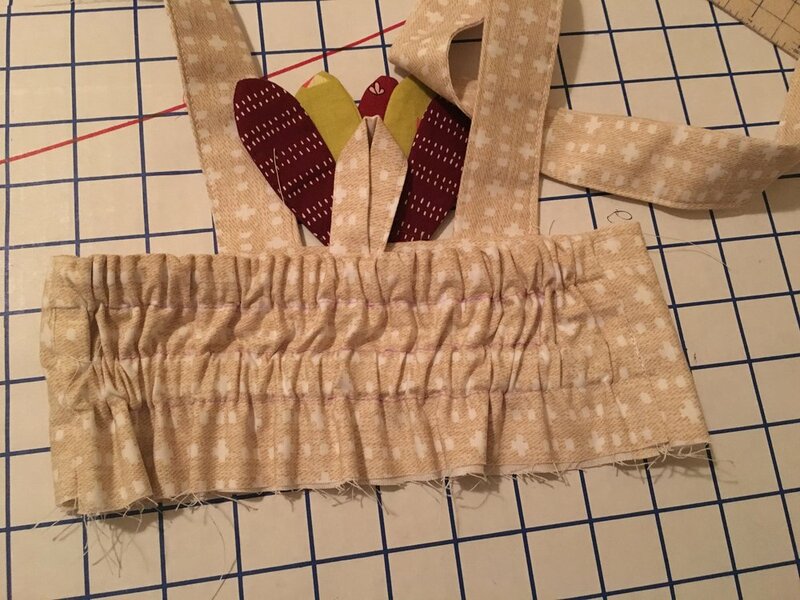 If you are doing a ruffle hem, you will want to place your ruffle strips right sides together and sew along the short side. Repeat until all four strips are connected in a loop. Next, fold your strip in half, bringing the bottom of the strip to meet the top, wrong sides together. Press. Sew a gathering stitch around the top of the ruffle strip and gather to be the same size as your skirt piece. Attach and topstitch. Now follow the pattern to the end! Congrats! You have completed the Animazing skirt! Don’t forget to post a progress pic as well as a final pic in the albums in the Facebook group to be entered to win the giveaway. I can’t wait to share my final photos with you! Hooray! You’ve made it to Wednesday! Today you are going to complete your waistband, and if you are on track, you will finish up your skirt tomorrow! Don’t you feel accomplished?! The first thing you need to do today is add the face to the front of your waistband. If you are using buttons for the eyes, I like to add those after the waistband is complete just because I feel like the buttons are more stable when sewn through the main and lining together. I am doing the turkey, so I appliqued my face pieces on the front main waistband before sewing anything else. If you are doing a button back (in the pattern) just follow those steps until your waistband is complete. For the elastic waistband, first you need to baste your straps and tie loop to your main front and back waistband. The tie loop will go in the center of the back waistband. Next, place your main and lining front waistband pieces right sides together and sew along the top long side only. Repeat for the back waistband pieces. Next, iron the seams open. Place your front and back waistband pieces right sides together and sew along the side seams. Your back waistband is longer, so be sure to line up the side edges before sewing. The front and back will not lay completely flat together because they are different lengths. After the front and back are attached, turn the waistband right sides out. Draw three lines ¾” apart along the back waistband using a fabric marking pen. This is how you create your casings. Now, sew along these lines from side seam to side seam. Finally, insert your elastic into the top and bottom casing. Make sure you stitch in the ditch to secure your elastic on either side of the back waistband. Congrats! You have now created an elastic waistband on your animazing. I love doing this because it can grow with my daughter and it is easier to get on a squirmy toddler because there are no buttons. Make sure you add at least one progress photo to the album in the facebook group for a chance to win a 5 pattern pack! I can’t wait to see what you all are working on! I hope you’re having a terrific Tuesday! Did you pick out your fabrics and prep your Animazing pattern yesterday? If not, there’s still time to do it! Today we are going to cut our fabrics and construct our straps. If you are going to have an elastic waistband on the back of your skirt, I have provided the cut chart below. Be sure to cut the length of your waistband according to the Animazing pattern. For the skirt, cut two skirt pieces according to the front skirt measurements in the cut chart. You will also need two pieces of ½” elastic. Also, if you are doing tie back straps you will only need to cut one strap loop instead of two. If you want to do this as well, cut your skirt length a half inch shorter than it says to in the cut chart. Then, cut four ruffle strips 2.5 inches long and the same width as your skirt. Tomorrow we will put the face on and construct our waistband. Don’t forget to post one progress photo and one final photo in the albums in the facebook group to be eligible to win a pack of 5 patterns!